A Northwestern alumna in her 80s recalls fondly the after-class sodas at Cooley’s Cupboard and tea at the Dominion Room on Davis Street. 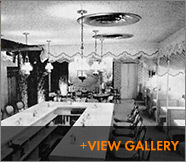 Both places are long gone, but we’d like to salute these and other nostalgia-producing spots where Northwestern students took advantage of youthful metabolic rates and munched, snacked, and dined with abandon. Before being renamed for Gary Barnett and his Rose Bowl-bound team, (when he left it was Coach’s Café, and is now the Globe Café) it was the Huddle. No matter what the name, it’s been a favorite place to cheer for the Wildcats. Northwestern University Archivist Kevin Leonard remembers that The Spot was the first place to serve beer with a meal, after Evanston’s traditional ban on alcohol was lifted in 1972. Now located in La Jolla, California, The Spot has the same Chicago-style pizza and pictures on the walls but the weather outside is often better.